After this boilerplate performance, I take great comfort in the thought that this was the last display of fumbled phrases and childishly robotic over-enunciation of everyday words. The last attempt to whitewash his unwise decisions with platitudes about “taking the fight to the terrorists” and head-scratchers like “promoting human liberty, human rights, and human dignity”. The last Bush speech from behind a podium. Whether the current financial situation we find ourselves in is due to the expensive “War on Terror” is surely to be disputed, of course, but it’d be pretty hard to argue that it’s helped the situation (unless one wants to make the claim that the Iraq intervention has somehow prohibited another financially ruinous attack, thereby being a net plus). It’s been 4 years since Osama released his “bankrupt the U.S.” October surprise, and it has been argued that the tape put Bush in the White House (as designed), so one may naturally wonder if AQ has something up their sleeve this time around. And like I posted in Part II, there apparently have been warnings of another attack. So, What would they do? An attack, or maybe drag Osama out of the cave to release another taunting video? Actually, the better question would be: Would the American people fall for it again, whatever they did? Update: No signs of Qaeda election threat – U.S. This is a thread for all the LOL’s over this McClellan book thing. I just find it hilarious width and breadth of the theories I’ve come across. Like, “who got to him” type stuff. “I question the timing” . Ya know. Deflector shields on MAX. 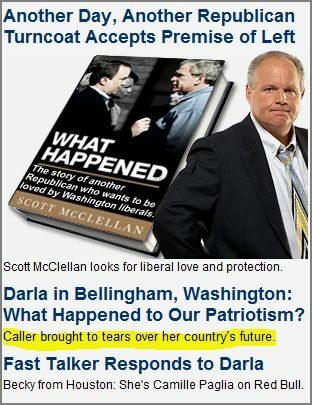 RUSH: We’ll start with Darla in Bellingham, Washington. Hi, Darla, nice to have you here. CALLER: Hi, Rush. I tell you, I’m so… I’m so… I can hardly talk. I am so upset about this Scott McClellan book. I — I have children and grandchildren that I have to try to protect in our great nation. And here for a buck, for payback, I don’t care what it is. He can’t wait ’til the president’s out of office? We have to do things, and, of course, he has more credence because he’s known, quote, unquote, the president longer than many so he comes out with this trashy crap in this book that gives to the haters of this country, the terrorists of the world. If it makes our news media wonder if the president’s going to comment on it while he’s trying to give a speech to a graduating class then, oh, it must be that important, well, if they say it and it emboldens them — and it always does embolden them — well, does it make the country safer? Where is the patriotism in this country? I can certainly say it. We have lost our soul. Scott, you’re a citizen of the country first. If it’s payback to the president, fine. Is it payback to me? Is it payback to my family, too? Do you have to make the buck first? (voice breaking) I am sorry I sound upset but, Rush, that’s just — I — I — I don’t get it. I’m — I’m fed up. Where is the patriotism in this country? Where? Why have we decided that we don’t just have to hate the president, we have to hate our country, we have to hate what it stands for, we have to put our desire for money and our 15 minutes of fame above everything? I’ll try to get more as I stumble upon it. Update: Good stuff at Sadly No! and Hysterical Raisins.